like a seal on the wax of our hearts: give thanks. For the taste of haroset which lingers for weeks. though the sea licks our ankles. The waters will part. then our ancestors' struggles were worth it. Today is the 26th day of the Omer, making three weeks and five days of the Omer. This is the 26th day of our 49-day journey from Pesach to Shavuot, liberation to revelation. Today's poem was inspired by a prompt from last year's NaPoWriMo, the one for the 26th day of the month (since this is the 26th day of the Omer) -- to write a curtal sonnet. no one promised pedicures and crumpets. under the weight of not-knowing what lay ahead? and marching when it lifted, no questions asked? (except for God) what's on the other side. This is the 25th day of the Omer, making three weeks and four days of the Omer. This is the 25th day of our 49-day journey from Pesach to Shavuot, liberation to revelation. In the kabbalistic paradigm this is the day of netzach she'b'netzach, the day of endurance within the week of endurance. This poem is an acrostic; if you read vertically down the first letter of each line, you'll see its theme. two stones on one, one stone on two. old walls the stitches holding her together. Today is the 24th day of the Omer, making three weeks and three days of the Omer. This is the 24th day of our 49-day journey between Pesach and Shavuot, liberation and revelation. Today's poem was inspired by one of last year's NaPoWriMo prompts -- the invitation to write a poem about stone walls or arches. The shape of today's poem is inspired by the "two stones on one" rule, and by the calligraphy of the Song at the Sea. of minarets against evening's blur. Judaism's in the paving stones. the bike, the men with sidecurls. were inscribed in two languages. Harmony's a long way off. like pastry drenched with honey. ready to be parted and savored. Today is the 23rd day of the Omer, making three weeks and two days of the Omer. This is the 23rd day of our 49-day journey between Pesach and Shavuot, liberation and revelation. In the kabbalistic paradigm, today is the day of gevurah she'b'netzach, the day of boundaries or borders or strength within the week of endurance. As I worked with Luisa's prompt, I found myself thinking about Jerusalem, and borders, and what endures. They steamed south until pack ice closed in. Faith in the journey kept spirits high. Always knew they'd reach the promised land. They'd trek across the expanse of white. The continent was a blank page before them. scribing holy writ with sledges and skis. The ship groaned, then buckled. they decamped to the ice, watched her go down. Any sane man knew they were lost. Hauled their lifeboats over mountains of ice. But Shackleton wouldn't let them lose hope. and rowed 800 miles in the world's worst seas. Shackleton wouldn't let them lose hope. To strive, to seek, to find, and not to yield! and he brought every man home alive. They'd steamed south until pack ice closed in. He brought every man home alive. Today is the 22nd day of the Omer, making three weeks and one day of the Omer. This is the 22nd day of our 49-day journey between Pesach and Shavuot, between liberation and revelation. In the kabbalistic paradigm, today begins the week of netzach, endurance. As I've written before, I can't hear the word "endurance" without thinking of Ernest Shackleton's Imperial Trans-Antarctic Expedition of 1914-17. That's what inspired today's poem. of vision. Yehoshua chased friendship. Yossi wanted to be a good neighbor. because his choice includes all of yours. and listen to the lub-dub of your lev. softening like pliable red wax in the sun? a new habit takes a month of practice. Four weeks remain before it's time to harvest. What grows inside your four chambers? Today is the 21st day of the Omer, making three weeks of the Omer. Today is the 21st day of our 49-day journey between Pesach and Shavuot, between liberation and revelation. Gematria is Jewish number-math. In Hebrew, letters double as numbers, which means that every word also has a numerical meaning. Lev is the Hebrew word for "heart." In one Mussar model, today is the day to meditate on the quality of לב טוב, a good heart. That phrase reminded me of a Hasidic teaching about the importance of having a good heart, which I blogged some years ago on Lag b'Omer: The bonfire of the expansive heart. and we are its windows. Today is the 20th day of the Omer, making two weeks and six days of the Omer. This is the 20th day of our 49-day journey from Pesach to Shavuot, from liberation to revelation. Today's poem was inspired by an image from the podcast Welcome to Night Vale, of a house in which the windows looked out on another world, and also by teachings I first heard in 2003 (I think from Rabbi Moshe Aharon / Rabbi Miles Krassen) about how we are windows and teshuvah (repentance or re/turn) is a process of clearing away grime. frozen lemonade, rattling across the expanse of sand. Today is the 19th day of the Omer, making two weeks and five days of the Omer. This is the 19th day of our 49-day journey between Pesach and Shavuot, liberation and revelation. Today's poem was inspired by one of Luisa A. Igloria's prompts from last spring, the one in memory of Gabriel Marcia Marquez. we've broken in our walking shoes. slips of paper which read to life! is a shiny pewter spigot, waiting. Today is the eighteenth day of the Omer, making two weeks and four days of the Omer. This is the 18th day of our 49-day journey from Pesach to Shavuot, from liberation to revelation. Hebrew letters double as numbers. The Hebrew word for "life" -- חי –– is numerically equivalent to 18. That's what sparked this poem. manna after a week of hardtack. after seven weeks of counting? Today is the seventeenth day of the Omer, making two weeks and three days of the Omer. This is the 17th day of our 49-day journey between Pesach and Shavuot, liberation and revelation. In the kabbalistic framework, today is the day of tiferet she'b'tiferet, balance and harmony within balance and harmony (it's the day of tiferet within the week of tiferet.) Today's poem didn't arise out of that fact, but I think there's something special about today being the day of balance and harmony squared, so I figured I'd mention it. How much of your life will you spend seeking shoes? sunglasses resting unnoticed on top of your head? Meanwhile the Holy One hides in plain sight. say thanks for the big bang still unfolding. Pedestrians carry bright umbrellas like nodding tulips. and determination: everything else is commentary. If you can't find your shoes, then go barefoot. Push your cart through the cluttered aisles. the part of you that thrives not on bread but on song? The sages say: what you're seeking is already here. Today is the sixteenth day of the Omer, which makes two weeks and two days of the Omer. This is the 16th day of our 49-day journey between Pesach and Shavuot, liberation and revelation. In the Mussar tradition, today is a day for focusing on the quality of "Apply business acumen to living." While I don't resonate with everything in this essay by R' Noah Weinberg, one line from the essay sparked this poem: "How much of your life will you spend being a shoe seeker?" A hidden name of God. each with its own psalm. on the people, opening channels. now our spines are straight. moving from degradation to joy. Today is the fifteenth day of the Omer, making two weeks and one day of the Omer. This is the 15th day of our 49-day journey from Pesach to Shavuot, liberation to revelation. In Hebrew, letters also double as numbers. The simplest way to write the number fifteen spells Yah, a holy name of God. (For this reason we often write 9 and 6 instead of 10 and 5, so as not to be using that holy name in vain.) Fifteen is a number with deep significance in Jewish tradition. then sandal-blisters, manna, and fear. the walk will be, how safe the passage. We don't know who we're becoming. from the living well? The pillar of cloud lifts. Strike camp. Take heart. Trust the unseen. You're already different from when you began. Today is the fourteenth day of the Omer, making two weeks of the Omer. We have traveled 14 days in our 49-day journey from Pesach to Shavuot, liberation to revelation. When I thought of the number fourteen, I immediately thought of the sonnet, that classic 14-line form. This is an untraditional sonnet; it has neither rhyme nor meter, though I hope that some of the internal assonance will make up for that. My favorite translation of the name God gives to Moshe -- Ehyeh Asher Ehyeh -- is "I am becoming Who I am becoming." God is always-becoming, and so are we. the loneliest is the workshop. miss the touch of weathered hands. to send meltwater churning through. of constant trembling before God. They believed redemption was at hand. in our own pounding hearts? Today is the thirteenth day of the Omer, making one week and five days of the Omer. This is the 13th day of our 49-day journey between Pesach and Shavuot, liberation and revelation. In the kabbalistic paradigm, today is the day of yesod she'b'gevurah, foundation or generation within boundaried strength. I found myself thinking about generations, and about generation of power, and that reminded me of the laundry/machine shop at Hancock Shaker Village. The penultimate verse hints at a Shaker hymn which I learned from Rabbi David Ingber of Romemu and which I sometimes use at my shul. It's called More Love. embossed in gold. Read their titles like Braille. in your hands, engraved pomegranates rattling. in your palm like a custom-made wand. and slash of calligraphy adorned with crowns. but the broadcast which flows from the source. Deliberately tune your dials to God's station. Delight in that. Taste the parchment's honey. Read the Torah of the geese overhead. Waltz with the Torah in every step. Today is the 12th day of the Omer, which makes one week and five days of the Omer. Today is the 12th day of our 49-day journey between Pesach and Shavuot, between liberation and revelation. According to one Mussar teaching which maps the days of the Omer to the qualities named in Pirkei Avot, today is the day for focusing on Deliberation, which they name in Hebrew as yishuv hamikra. That webpage links this day with Psalm 1 verse 2, אִם בְּתוֹרַת יְיָ, חֶפְצוֹ; וּבְתוֹרָתוֹ יֶהְגֶּה, יוֹמָם וָלָיְלָה -- "That one's delight is in the Torah of Adonai, and that person meditates on it day and night." 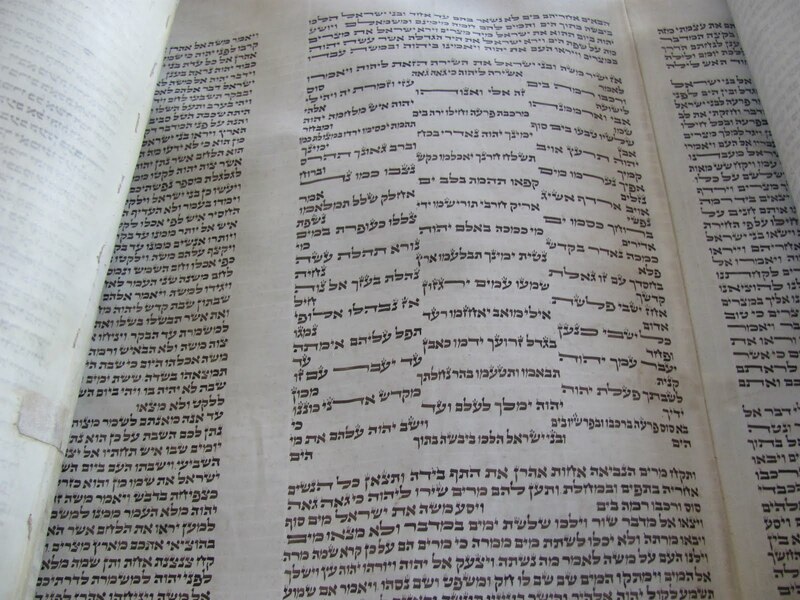 "Torah," of course, can mean much more than just the Five Books of Moses. That's the idea which gave rise to this poem. and let your eyes go soft. Grow roots from heel and toe. Draw water up from your depths. What flowers will you bloom? Today is the 11th day of the Omer, which makes one week and four days of the Omer. This is the eleventh day of our 49-day journey from Pesach to Shavuot, from liberation to revelation. In the kabbalistic paradigm, today is the day of netzach she'b'gevurah, the day of endurance within the week of boundaried strength. Endurance made me think of redwoods; and trees plus boundaries made me think of the xylem and phloem through which water brings nutrients from a tree's roots to its crown. to stargaze while you wait. until you see the voice that day! of celebrating what God has made today. Balance urge to run, willingness to wait. The trip is free. Blessings abound. Trust you'll be there on the 50th day. Today is the tenth day of the Omer, making one week and three days of the Omer. Today is the tenth day on our 49-day journey between Pesach and Shavuot, liberation and revelation. Ten days down, 39 to go. What is the journey like for you so far? Can you still hear the song at the sea? We all walked together, my hand on your shoulder. You gained a new name in the journey. and gained a new name in the journey. Sing now the song of your wholeness. You carried your ancestors' bones. sing them the song of your wholeness. Reveal your yearning without fear. Sing peace for the cousins who bicker. This is the gift: a channel with walls. Pour out your love. The container will hold. Don't let the wonder recede. How did you feel when your waters parted? Today is the ninth day of the Omer, making one week and two days of the Omer. Today is the ninth day of our journey from Pesach to Shavuot, liberation to revelation. As I wrote this, I was thinking about how it feels to be after the seder, trying to hold on to the spiritual high even as time keeps pulling us away. Also about the Song at the Sea. This went through a few revisions, and around draft 3 I realized that it wanted to be a pantoum and it all came together. The judge sees through you like an X-ray. Let your heart give up its secrets. and offer up what beats inside. Today is the eighth day of the Omer, making one week and one day of the Omer. This is the 8th day of our 49-day journey between Pesach and Shavuot, liberation and revelation. In working on today's poem, I found myself paying particular attention to rhythm. This is a good one to read aloud. This second week of the Omer, in the kabbalistic paradigm, is the week of gevurah -- boundaried strength or discipline. That drew me to the image of God as Judge, which in turn reminded me that the Hebrew word which means to pray, להתפלל / l'hitpallel, literally means to judge oneself or to discern oneself. The final two lines are Reb Zalman z"l's rendering of the Hebrew words which follow the shema, baruch shem k'vod malchuto l'olam va'ed, which we recite aloud only on Yom Kippur. Though we do sing them aloud in the prayer Ana B'Koach, which some have the tradition of reciting after counting the Omer each day. Re: "I gravitate / toward this old-fashioned leather strap..." -- that's a reference to tefillin, about which I have blogged many times before. but what do those words mean to you? whether source or force, wellspring or ruler? make these forty-nine days count. mountain awaits. Bring the Omer. Today is the seventh day of the Omer, making one week of our journey from Pesach to Shavuot, from liberation to revelation. Today's poem takes the form called a golden shovel. If you read the last word of every line, you get "Blessed are You, Adonai our God, ruler of the universe; You make us holy with Your mitzvot, and command us to count the Omer" -- the traditional blessing recited alongside the actual counting of each day. "All the mitzvot / add up to this: every sinew in the body and / every day of the year" -- in Jewish tradition, it is taught that there are 613 mitzvot (connective-commandments) in the Torah. Tradition further says that there are 248 positive mitzvot, one for each of the bones and sinews in the body, and 365 negative ones, one for each day of the year. Whether or not there are actually 248 parts of the human body, I love the idea that the mitzvot can be related to every day of our lives and to all that we are.